Mysuru: Maintaining that 12th century social reformer Basavanna’s preachings have been incorporated in the Constitution, Assembly Speaker K.S. Koliwad said that everyone should work for the welfare of the society. He was speaking after inaugurating ‘Basava Jayanti’ celebrations and ‘Basava Ratna’ award presentation function organised by Mysuru Sharana Mandali at Sri Shivarathri Rajendra Bhavan in JSS Hospital premises here yesterday. Pointing out that our work and deeds should inspire others, Koliwad said that Basavanna always fought for social justice and equality. Stating that Chief Minister Siddharamaiah who has a lot of respect for Basavanna, had ordered putting up of Basavanna’s portrait in all Government offices, the Speaker welcomed the Government’s decision to name Karnataka Women’s University after Akkamahadevi. PWD and District in-Charge Minister Dr. H.C. Mahadevappa, who presided, said that Basavanna began his campaign for social justice from his home. Maintaining that Basavanna walked out of his home after renouncing Upanayana, the Minister said that Basavanna opposed gender inequality. Highlighting Basavanna’s efforts for bringing about equality in the society, Dr. Mahadevappa noted that Basavanna’s principles were very much relevant even today. Observing that practising the principles of Sharanas in their true sense will bring about peace, harmony and brotherhood in the society, he urged the Government to install a bust of Basavanna in Vidhana Soudha premises. Dr. Somashekhar further asked the Government to name Namma Metro and Gulbarga University after Basavanna and also to script a few lines of Basavanna’s Vachanas on the portraits of Basavanna put up in Government offices. Jayadeva Institute of Cardiovascular Sciences and Research Head Dr. C.N. Manjunath, who was one of the recipients of ‘Basava Ratna’ award, in his address, stressed on the need for increase in the number of human beings with values. Pointing out that it was important to become a Vishwa Manava in our lifetime, he said that Basavanna, Gandhiji and Dr. Ambedkar always fought for a society that was rich in Samskruti and Samskara. Bemoaning that British Laws in Government Departments had pushed many people to a lot of inconvenience, Dr. Manjunath emphasised on the need for making amendments to such laws, so as to benefit people. Explaining the concept of ‘Treatment first, fee payment later,’ he said that saving the lives of people was of paramount importance than maintaining files. Another award recipient A.T. Ranganath, in his address, said that politicians should not fool people who have elected them and asked them to focus more on the well-being of the society. Dr. C.N. Manjunath, KRIDL Managing Director Dr. M. Raju, Veteran Kannada activist A.T. Ranganath, Social Worker Dr. Sharada Channabasappa, Swachh Bharat Abhiyan Pioneer H.V. 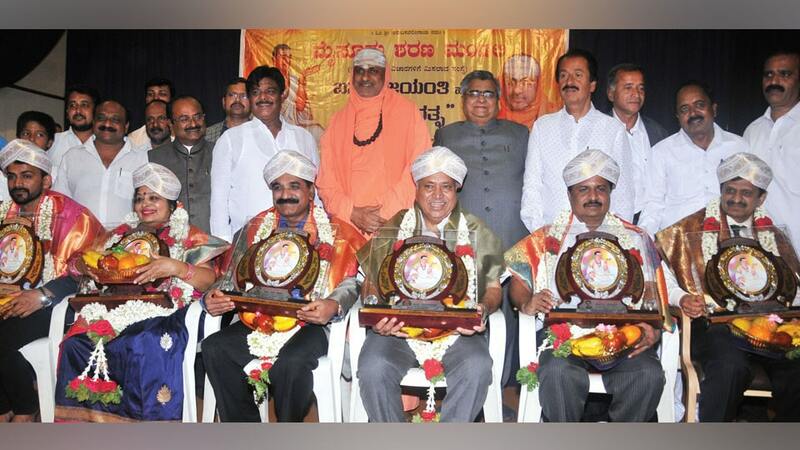 Rajeev and actor Dhananjaya were conferred ‘Basava Ratna’ award on the occasion. Suttur Seer Sri Shivarathri Deshikendra Swamiji graced the occasion. Prof. J.M. Thippeswami (Special Officer on Duty of Assembly Speaker), Karnataka Fisheries Co-op. Federation President S. Madegowda, MLA Vasu, Sharana Mandali Hon. President U.S. Sekhar, President Mugur Nanjundaswamy, Convenor M. Chandrashekhar and others were present.